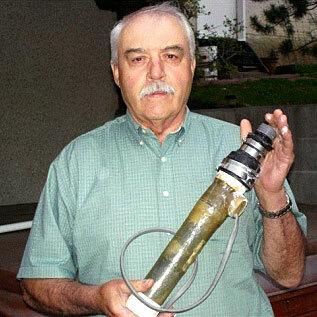 Here is a picture of me with a Watermaid salt chlorinator cell purchased in 1987. As salt chlorinators were not available in Canada at that time, it was purchased from Australia. It came with a three year warranty but lasted until 2005. Hoping new cell from Watermaid of Canada in Richmond Hill will give me comparable service. 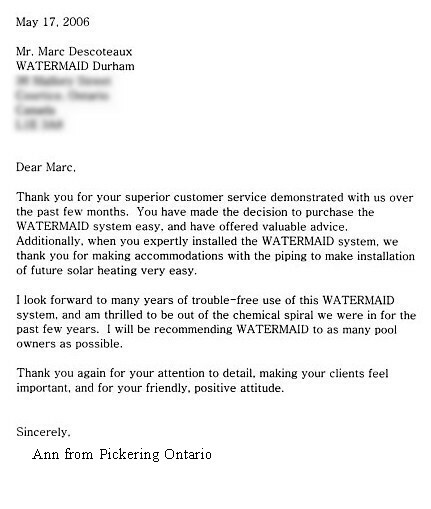 I would like to thank you and Mark for your help with the purchase of my Watermaid system. I am pleased to say that it was installed today and it is working wonderfully. I was very pleased with the entire sales process from the initial phone call which I made to the Head office where I all of many questions were answered to my personal dealings with you. I found the entire Watermaid team to very helpful and knowledgeable. You help me understand the differences between the other systems on the market and the Watermaid system. As mentioned, it is now operational and I am looking forward to not having to add chlorine each and everyday and not waking up to “green water” on the times where I had forgotten or was away. I was not able to take a picture to send you but I will provide one within the next few days. Again, thank you very much for the excellent service and I would not hesitate to recommend both you and the Watermaid system to anyone who wishes to have a maintenance free pool. I wanted to drop you a quick line and let you know how pleased we are with the system we installed this spring. We have really enjoyed the pool this year. The system has certainly exceeded our expectations.